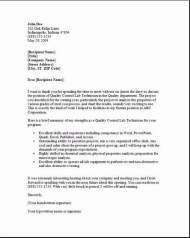 What is our job acceptance letter template? Basically it is a standard form letter used to accept a job offer. All that needs to be done is for you to edit the letter with your own specific information pertaining to the job you just landed. If you were fortunate, and had several other offers but they appear to have little difference in which one you choose, you will have to revisit your list of needs. Use this list to compare location, the company culture, and their approach to training, or possibly how did you feel at the interview, etc. Trusting your own instincts. After you figure this all out, then you send the acceptance letter. 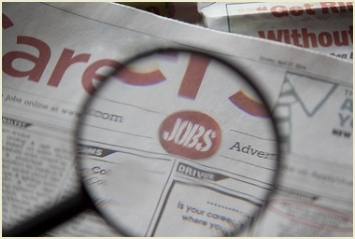 By accepting a job offered to you by an employer, this will then obligate you to stop all of your job search efforts. You should then notify all other prospect companies that you will be withdrawing yourself from their list of applicants for the position you applied for. This is only proper etiquette, a nice courteous telephone call should keep you in good future standing with their company if so needed in the future. Try to really get a hold of the person (one on one) don't just leave a voice mail message. After your conversation with them, then write a confirmation (e-mail or hard copy). Write to formally thank the person that has made you the job offer. If they have given you a job reference number, then include it in your acceptance letter along with any other information they requested after the offer. Make sure you date your letter and then quote their full job title along with the starting date they have chosen. Now you need to go ahead and accept their offer and state how you are really looking forward to getting started and working for their company. You really need to make a copy of your acceptance letter, along with the job offer letter they sent you, these will now become a contract. You really shouldn't accept a company's job offer if you our undecided and might reject it later because something better turned up. 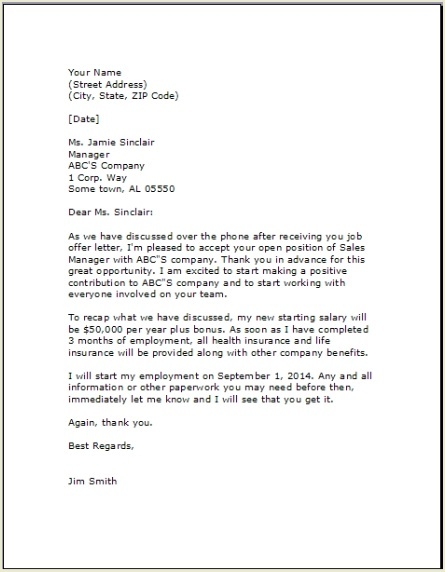 Your Job Acceptance Letter Template might look similar to ours below. 1. You can copy and paste the document into word and work on it at your convenience!! Or you may choose to download it from the link above. As we have discussed over the phone after receiving you job offer letter, I'm pleased to accept your open position of Sales Manager with ABC"S company. Thank you in advance for this great opportunity. I am excited to start making a positive contribution to ABC"S company and to start working with everyone involved on your team. To recap what we have discussed, my new starting salary will be $50,000 per year plus bonus. As soon as I have completed 3 months of employment, all health insurance and life insurance will be provided along with other company benefits. I will start my employment on September 1, 2014. Any and all information or other paperwork you may need before then, immediately let me know and I will see that you get it. Congratulations on you job offer? I know there is a lot to keep track of during the job hunting process. So it is a wise thing to do by actually sending this or a modified version of our job acceptance letter template. You will have a record if needed and more than that, creating one and sending it lets the employer know you are on top of things by doing your part.